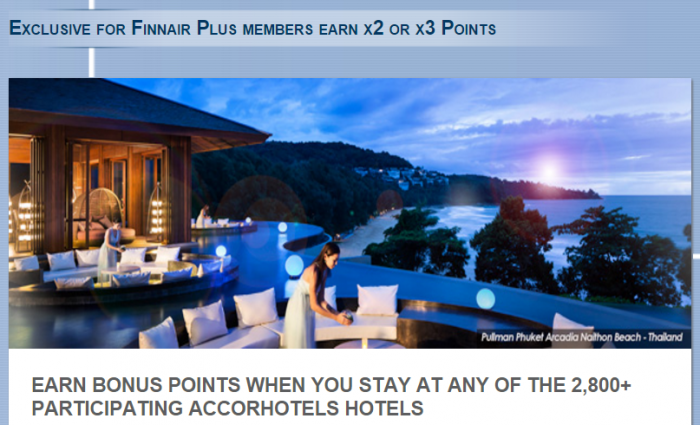 Le Club AccorHotels has launched a double and triple Finnair plus miles promotion for stays between November 1 – December 31, 2015. You must have your Le Club AccorHotels earning preference set to airline miles and have Finnair Plus chosen as the designated partner where the points are converted automatically after each and every stay. – And triple points as Silver, Gold or Platinum at Pullman, Sofitel, Sebel, or Grand Mercure ones. This would imply that Silver/Gold/Platinum members would not earn any extra points for stays at Mercure, Novotel or Adagio brands and Classic members would only earn base points for stays at Pullman, Sofitel, Sebel or Grand Mercure ones. Not sure how well thought this is? 1. General Le Club AccorHotels terms and conditions apply to the x2 and x3 Finnair Plus offer. 2. This offer is valid for a stay from November 1 and December 31, 2015 in one of the participating hotels worldwide, and booked between November 1 and December 31, 2015. 4. To benefit from this offer, your booking must be made on Accorhotels.com or our participating brands web sites or via AccorHotels call centers. All other reservation channels will not be eligible to this offer.